The metalcasting industry is always moving ahead. Whether it’s how to pour the purest metal, produce components with as little scrap as possible, or plunge into additive manufacturing, when foundries look for ways to push into the future, they’re successful. Then it should not be a surprise that the industry is working to make sure there won’t be a shortage of employees for the next decades of production. When you talk to plant managers and metalcasting leaders, that’s an issue that comes up frequently. One way to make sure the future workforce is strong in talent and numbers is to train the next generation at the university level, and that’s happening all across the country at Foundry Educational Foundation schools. The programs have their little differences, and no two professors are alike, but the goal is the same: to attract bright minds to the metalcasting industry. Following are sketches of three FEF-certified schools and the ways they are drawing tomorrow’s leaders to the industry today. The metalcasting program at Michigan Tech is in the university’s Materials Science & Engineering Department, and that means the Michigan Tech program is very interested in the alloys it pours, the microstructures that form within the cast part, and characterizing the properties and behavior. Students at Michigan Tech get to apply what they’re learning in a working foundry. In the 2,700 sq. ft. metalcasting space, there is a 125 kW induction power supply tapped to a 300 lb. or 50 lb. induction furnace. There are gas-fired and resistance melters for nonferrous metals, especially aluminum. There is green sand and other types of molding, and now the school uses 3D printing to print patterns that are usually molded with chemically bonded sand. “We’re pretty quick to prototype things because we’ve got a decent 3D printer to print patterns,” Sanders said. One crucial focal point for the Michigan Tech program is staying up to date with all developments in the industry. It’s important to make sure students are proficient on the most current technology when they graduate. The school has a model just for that. Michigan Tech has numerous loyal alums in the industry, and they want to make sure the program thrives. The school does research and development for the industry, which brings in revenue that pays staff and keeps equipment humming. There’s also another benefit. The foundry, Sanders stressed, gets used. A lot. 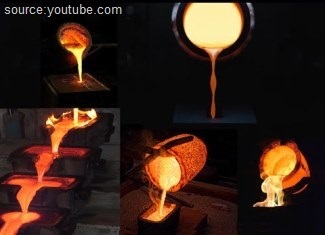 The metal casting course uses the foundry up to four times per week. There are capstone senior design projects, industry-sponsored projects for underclass students, and even graduate-level research projects that use the facilities. In recent years, metal sculpture classes from the Visual and Performing Arts Departments at both Michigan Tech and nearby Finlandia University have used the foundry for their class projects. In between these educational activities, the full-time staff will use the lab to conduct projects for industry sponsors, as well. Taken together, the facility stays very busy. “All of that activity really helps keep things working and investment flowing,” Sanders said. It also keeps new minds flowing into the industry. Practical experience is crucial for students preparing to enter any field. Whether it’s journalists working at a student newspaper, nascent teachers getting their first chance in a classroom or young accountants earning valuable experience in an internship, real-world practice is a key part of any preparation. That’s apparent at the University of Northern Iowa Metal Casting Center (MCC). One example is Austin Knapp. A senior at UNI, Knapp “didn’t really find (his) thing” when he came out of high school so he went back to Kirkwood Community College (Cedar Rapids, Iowa) and did CAD mechanical engineering. Knapp enjoyed that but didn’t have a niche to draw, so he was drawing pretty much anything he could though it didn’t appeal to him to draw other people’s designs. Knapp decided to go for a degree from a four-year school, and was told he could transfer into UNI and do two or three more years but leave with two degrees. Knapp was speaking at TechWorks, the school’s additive manufacturing center that features a 3D printer that was the largest of its kind in North America when added. The MCC connects university research to the industry and works with metal casters of all sizes from all over the continent. Knapp works in design at TechWorks and now has a focus: drawing castings and rigging systems, while learning about solidification and what he has to do to improve the components. UNI’s metalcasting program is divided into five areas: transport phenomena, applied metallurgy, molding practices, melting process, and tooling practices. Its fully equipped foundry covers 5,500 sq. ft. There is also 4,000 sq. ft. dedicated to core and mold testing and sand analysis, and 1,000 sq. ft. houses the mechanical testing and analysis equipment. The additive manufacturing area covers 15,000 sq. ft.
Russ Rosmait doesn’t mince words when asked about the importance of his—and other—programs for the future of the metalcasting industry. Pittsburg State, which covers all metal casting processes and focuses on investment casting, has a modern foundry that includes a 125Kw melting furnace, a steam autoclave and burn-off furnace for investment casting, a 150 lb./min continuous mixer and a 125-ton wax injection press for the program. Some students even go to Australia for internships, and experience a faraway land while hearing ideas to improve the industry from another country. When it comes to recruiting, Pittsburg State has a feeder class in manufacturing methods, and everybody in that class goes through a small section of metalcasting. Some students will go through that portion and it will click for them after seeing the pouring of metal and the majesty of producing metal castings. The metalcasting program also does student outreach with the Boy Scouts and Girl Scouts, and there are open houses in the spring and fall. The pitch to prospective students is self-explanatory.